Product info: Width: 3 m. Length: 3 m. Side height: 2.1 m. Ridge height: 3.4 m. Roof cover: 300 g/m2 300Dx300D Polyester with PU coating on back Sidewalls: 300 g/m2 300Dx300D Polyester with PU coating on back Frame: Powder coated steel tubing for protection against corrosion Tubes / fittings: 22x10x0. Width: 0.76 m. Length: 2.4 m. Side height: 0.74 m. Weight: 2 kg. Easy iron Machine washable at 40°C Perfect fit The price does not include freight. Please contact our customer service. Dancover Ireland Our professional sales advisors are at your service. Call us on 151 33 003 www. Material: Strong polyethylene tarpaulin 300 gr./m² Width: 3 m. Length: 10 m. Weight: 10 kg. 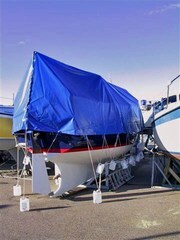 Low-priced cover solution Ripstop Eyelets The price does not include freight. Please contact our customer service. Dancover Ireland Our professional sales advisors are at your service. Material: Synthetic Weight: 1 kg. Wash at 40 ° C Description Beautiful white chair cover. Tailored to fit a 44 x 44 x 80 folding party chair, this attractive cover is quick and easy to fit and remove. The cover is fully washable at 40° C and air dried for best results. The price does not include freight. Roof cover: Strong polyethylene tarpaulin 300 gr./m², Flame retardant, 100% Waterproof Sidewalls: Strong polyethylene tarpaulin 300 gr./m², Flame retardant, 100% Waterproof Frame: Galvanized steel tubes Tube diameter: 32mm Width: 2.4 m. Length: 3.6 m. Side height: 1.93 m. Ridge height: 2.4 m.
Roof cover: Strong polyethylene tarpaulin 300 gr./m², Flame retardant, 100% Waterproof Sidewalls: Strong polyethylene tarpaulin 300 gr./m², Flame retardant, 100% Waterproof Frame: Galvanized steel tubes Tube diameter: 32mm Width: 2.4 m. Length: 6 m. Side height: 1.93 m. Ridge height: 2.4 m. Included: Stake pegs Weight: 89. Material: 100% Recycled PE Width: 0.5 m. Length: 0.5 m. Side height: 0.05 m. Weight: 245 kg. 100% recycled Pe and 100% recyclable UV-resistant Max load 90 t/m² Stands almost any amount of cold or heat Does not need maintenance Approach ramps are optional extras The price does not include freight. Frame: Aluminium Width: 0.35 m. Length: 3 m. Side height: 0.97 m. Weight: 17.5 kg. The price does not include freight. Please contact our customer service. Dancover Ireland Our professional sales advisors are at your service. Call us on 151 33 003 www.dancovershop. Tarpaulin PVC heavy duty Tensile strenght 1800N/5cm Tear resistance 280N Temperature resistance -30 / 70 celsius Brass Eyelets Ø18mm, for each 1 m Tear resistance eyelets 950N Ripstop Description Strong tarpaulin in heafvy duty PVC heavy duty. Ideal for multiple covering purposes. Material: 100% Polyester Width: 2.5 m. Length: 16 m. Weight: 20 kg. Description Beautiful and practical carpet for marquee. Give your marquee a stylish and comfortable base while minimizing dirt, moisture and drafts. The carpet is easy to install. Best on firm surface. The price does not include freight. Material: 100% Recycled PE Width: 0.5 m. Length: 0.5 m. Side height: 0.05 m. Weight: 120 kg. 100% recycled Pe and 100% recyclable UV-resistant Max load 90 t/m² Stands almost any amount of cold or heat Does not need maintenance Approach ramps are optional extras The price does not include freight. A. Pulpit legs: 2 pcs B. Pushpit legs: 2 pcs C. Deck legs 0, 9-2, 05 m: 2 pcs C. Deck legs 1, 5-2, 8 m: 4 pcs C. Deck legs 2, 0-3, 3 m: 2 pcs Max width of boat: 4, 2 m Perfect for sailboats with pushpit, pulpit and guard rail Adjustable legs in both directions Frame keeps tarpaulin from the sides for perfect ventilation Description This frame with overhang fits sail boats with pulpit and pushpit. Amazing LED décor light for indoor or outdoor use. Wireless and rechargeable. Remote control included. Multiple colours and functions. Product info: Width: 0.2 m. Material: PE Wireless Rechargeable Adapter included RGB remote control included Charge time: 4-6 hours Wireless working time: 8-12 hours (when fully charged) There’s a million places and ways to decorate with this amazing and fashionable LED Light. Material: 100% Recycled PE Width: 0.5 m. Length: 0.5 m. Side height: 0.05 m. Weight: 90 kg. 100% recycled Pe and 100% recyclable UV-resistant Max load 90 t/m² Stands almost any amount of cold or heat Does not need maintenance Approach ramps are optional extras The price does not include freight. Product info: Width: 5 m. Length: 10 m. Side height: 2 m. Ridge height: 2.75 m. Roof cover: Strong polyethylene tarpaulin 200 gr./m² Frame: Galvanized steel tubes Tubes / fittings: 38x1.0 mm The price does not include freight. Please contact our customer service. Dancover Ireland Our professional sales advisors are at your service. 25m LED Light Rope with 36 lights per meter. For indoor and outdoor use. Remember adapter! Product info: Length: 25 m. Colour: Blue Plug directly into power outlet 230 volts Transparent PVC tube with 36 LEDs per meter Description Add to your party an extra touch with this attractive, light rope. Material: 100% Recycled PE Width: 0.5 m. Length: 0.5 m. Side height: 0.05 m. Weight: 125 kg. 100% recycled Pe and 100% recyclable UV-resistant Max load 90 t/m² Stands almost any amount of cold or heat Does not need maintenance Approach ramps are optional extras The price does not include freight. Blinking LED party light. 48 pcs. Fairy Berries blink smoothly and create a wonderful atmosphere. Use them anywhere indoor or outdoor. Fairy Berries will blink beautifully 2-3 days. Please note Fairy Berries are not rechargeable. Product info: Width: 0.02 m. Length: 0.02 m. You will fall in love with these amazingly cute Fairy Berry party lights immediately! They are so much fun … Fairy Berries blink smoothly and create a wonderful atmosphere. Decorative solar table lamp for outdoor use, white LED, 156mm x 230mm. Product info: Width: 0.16 m. Side height: 0.23 m. Elegant table lamp for outdoor use which gets its energy from the power of the sun. The price does not include freight. Please contact our customer service. Dancover Ireland Our professional sales advisors are at your service. Wireless submersible LED lights, including batteries. Waterproof and re-usable, For indoor and outdoor use. Mixed colours: white, blue and pink Product info: Width: 0.03 m. Length: 0.03 m These fun LED lights are perfect for lighting up anything you can imagine! Use them as you would tealight candles or votive candles, in floral arrangement or table settings. Dublin ads Dublin, All categories classifieds Dublin, All categories free ads Dublin, ads for sale Dublin, ads to buy Dublin, FREEADS in Ireland Dublin Page number 5-1. Find here ads for sale, to buy and rent in Dublin. Goods for sale in Dublin, vehicles for sale in Dublin, Dublin real estate for sale, Dublin property for sale, property for rent in Dublin, business ads in Dublin, Dublin business classifieds, services in Dublin, Dublin services ads, jobs in Dublin, pets for sale in Dublin, Dublin dating, Dublin cars for sale.